What will the weather be like at Cortijo La Haza? What’s the weather like? One of the most asked questions anywhere in the world, of course, and a hot topic of conversation here at our casa rural in Córdoba province. The answer for this area seems to surprise a lot of guests. The expectation of many is 365 days of sunshine and tropical temperatures, as unrealistic as that may be. It seems to be quite appropriate then that this morning’s temperature was 0 degrees with a light dusting of snow… And it is still bitterly cold as I am writing this (February). Some guests arrived last Saturday whose plan is to relocate to the area soon. 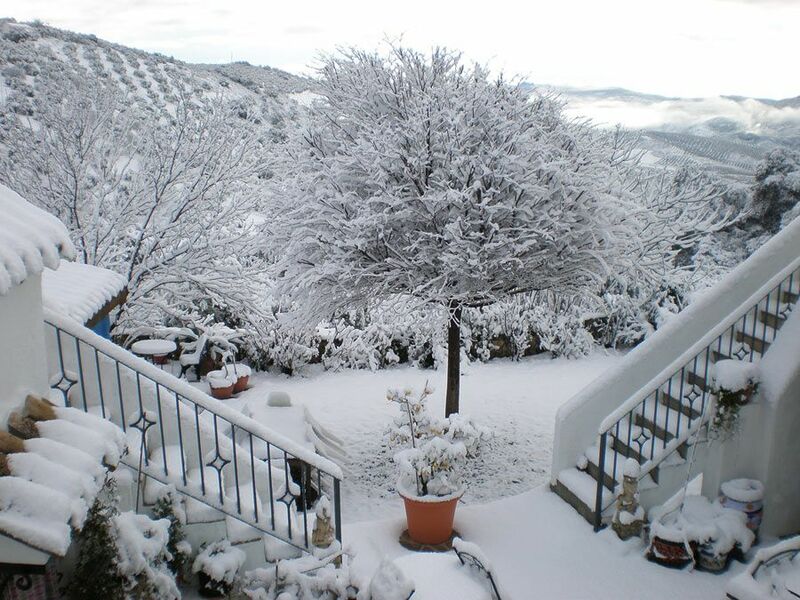 So they were interested in knowing what winter brings to Southern Andalucía. They got treated to two extremes within two days, arriving as they did in brilliant sunshine and blue skies (if cold), which turned nasty overnight with freezing temperatures and wet weather turning to snow in the afternoon. The weather for this area is largely dependent on geographical location. A visit to the petrol station this morning (3 kms away) saw surprise on the face of the attendant when she spotted our car covered in snow. The petrol station’s location, however close, is roughly 130m lower than ours (alt. 770m), resulting in a rainy morning instead. So what will the weather be like during your stay? Yes, that too is a question we often get asked. The truth is that we don’t know any more than you do, of course. To a degree it depends on what you expect from your stay. As a rule of thumb, if you want really consistent weather, wait until June, although both April and May have a number of beautiful days, in increasing numbers. Parts of July and August can be extremely hot (35 average daily), and it is rare for it to rain from early June all the way to mid-September. Around that time there tends to be a massive thunderstorm which cools down the area instantly. Beautiful days but cooler evenings ensue, with an Indian summer continuing right into October. Even if the weather is unpredictable, there are ways of finding out what it has in store for you around Cortijo La Haza. Bernadette tends to check the weather forecast for various areas (your excursions) every morning. And while you are making plans at home, you can keep up to date with the weather from various websites, such as www.eltiempo.es, but the best one for the area is offered by a local expat, Peter Cleife, who has a professional weather station which you can access via this link: https://www.wunderground.com/personal-weather-station/dashboard?ID=IANDALUS9. It will give you daily readings for temperatures, precipitation, wind, etc. etc. Peter also runs a Facebook group, but you may have to join the group to appreciate the full benefits. Please make good use of the links provided. Where necessary, build up a picture of what you can logically expect for the period you wish to stay. And please don’t be like the guests who came for a “beach holiday” in early May, found it was too cold and then held us personally responsible for the bad weather (in writing! ), and with two bad reviews to boot. They could have taken less time than it took to write those reviews to find out online that their plans for an early May sun-filled holiday were bound to end in tears, but it’s always better to blame somebody else I suppose… Come to Cortijo La Haza, enjoy the place whatever the weather, we’re here to help you do so.